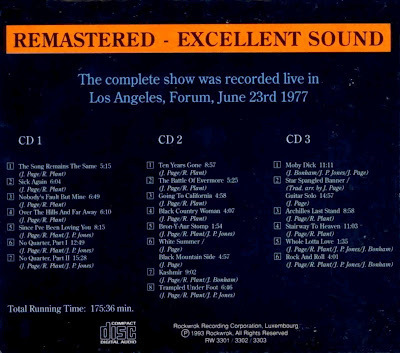 Recorded Live at The Forum, Los Angeles, CA, USA - June 23, 1977. Files: 21. :: Size: 940,02 MB (flac). Notes: This is audience recording from bootleg label 'Rockwrok'. All thanks go to Mr. LedZeppelin68 from Russian tracker for sharing this boot. 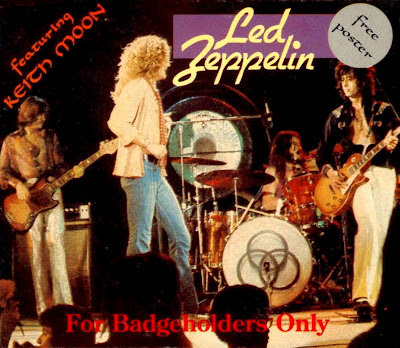 WARNING: back-cover lists that this is complete recording from June 23, but argenteumastrum says: FOR BADGEHOLDERS ONLY: ROCKWROK RW 3301-1~3 Recording: Excellent to Superb stereo audience. Source: The Forum, Inglewood, Los Angeles, California June 23 '77. 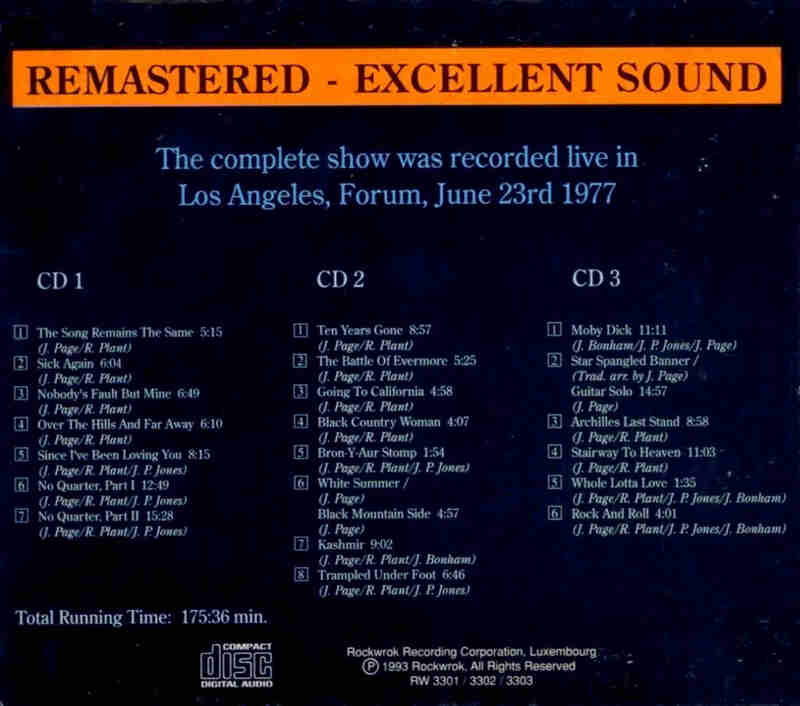 except (*)The Forum, Inglewood, Los Angeles, California June 21 '77. Comments: Japanese bootleg. Deluxe three single jewel cases around card slipase. Including poster. 6/21/77 not listed on cover. (+) with the special guest of Keith Moon.Lineage: Silver CDs > EAC > WAV . FLAC Frontend > FLAC > tracker > HD > Audacity lossless test. Full Artwork included. Have a fun...M..<-(Info taken from original info file). you honor us with great bootlegs. Thank you.